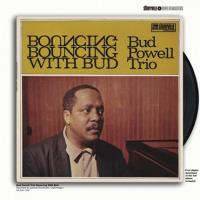 Bud Powell is the hardest of the be-bop masters to get a clear fix on. Charlie Parker left behind a stack of Dial and Savoy sides as the benchmark for improvisers in the mode; Miles Davis and Dizzy Gillespie were copiously recorded and it's easy to find large chunks of material documenting both players at the top of their powers. Thelonious Monk is simple: the Bluenotes, the Prestiges, at least half the Riversides and you have ample testimony of his genius. But Powell is a different matter, and from the records he has left behind one is left with the impression that twice as manyor three times as manyextant recordings would make it no easier to confidently summarize his achievement in music. The perceived quality of his recordings is strangely evanescent. One night, even his best material may seem cliche ridden, prone to technical fumbles, more driven than expressive. Other nights, all but his very worst recordings seem to reveal depths of invention and expression found in very few pianists. The problem of quality and representativeness is raisedless than succinctlyby two boxed sets recently released by Blue Note and Verve records. 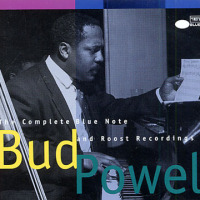 Blue Note's four disk and Verve's five disk sets document the long stretch of Powell's career which most observers agree contains its peakfrom a 1947 session for Roulette (available on the Blue Note set) to a 1960 Blue Note trio side that finds Powell playing in the middle of his sojourn in Paris. As such, the sets start after the beating from police which Powell received in 1945, which many believe led to his life-long erratic behavior on and off the stand, and end well into his declining years, when his technical facility was clearly on the wane. Even these sign-posts are misleading, however. Listen carefully to his devilishly fast runs on the early Verve trio sides and the occasional mistake soon becomes apparent. Unlike Parker, who played within his ample technical means for most of his career, Powell was always pushing the limits of what he could do. His lines don't just _sound_fast; they _feel_fast because they reveal Powell playing and thinking at his absolute top speedone more click of the weight down the metronome arm, the listener can't help sensing, would send the whole musical structure spinning off into chaos. Which, in later years, is exactly where many of his solos end up. Both the Verve and Blue Note sets contain a lot of fat on themat least from the perspective of a bad night. Blue Note fills two discs with Bud hovering near his ever elusive peak formfrom the Roulette 1947 trios (which find him still slightly callow) to more trios for Roulette in 1953 (a sequence of (mostly) ballads veering towards the morbidly melodramatic). In between are some truly brilliant trio sides, including the bop standards "Night in Tunisia" and "Ornithology," some of his best-known compositions such as "Parisian Thoroughfare" and "Un Poco Loco," and the bizarre but stately original, "Glass Enclosure," said to describe his state of mind while a night-club manager was keeping him a virtual prisoner in a hotel room. There are also some quintet sides with Sonny Rollins and Fats Navarro in the front line. Aside from a brief session with trombonist Curtis Fuller, these are the only sides with horns on either box set, and not quite the masterpieces the liners make them out to be: neither horn player seems entirely comfortable with the tunes and Powell is somewhat buried in the mix. The last two discs document sessions cut for Blue Note during 1957 and 1958, ending with the sole trio side from 1960. None include top-flight playing, but Powell's ideas are usually worthwhile and most of the titles are originals. Bud is the least known of the be-bop composers, but probably the most interesting after Monk. Verve, on the other hand, offers one long (77 minutes) disc of Bud burning through trio and solo versions of originals and standards, and four more disks of less intense, more uneven trio meditations on a similar mix. (The Verve set features fewer Powell compositions and more standards than the Blue Noteone possible factor to take into consideration if choosing between them.) Discs two and five offer the most engaging playing after one, and only disc three includes material that probably didn't deserve release (a January 12th, 1955 session in which Powell stumbles badly throughout and seems to have little to express). The most disturbing moment of the whole Verve box, however, comes on the recordings from Jan 13th, just a day after the train-wreck session. Here, Bud is in better shapetechnically at least. He deconstructs Monk's "Epistrophy" and garbles "Sweet Georgia Brown," but the most striking cut is the session's first. On "Mediocre," Powell plays a repetitive melody over a descending series of chords for about three minutes, making increasingly outre variations on the melody rather than soloing over the chords. Slyly humorous, in the manner of Monk, for the first minute or so, the descending chords become increasingly disjointed and mechanical as the record progresses; the eerie feeling is only increased by the bad condition of the recording, which makes the end of the track wobbly and distorted. All in all a frightening record which seems a direct expression ofrather than an aesthetic response to (a la "Glass Enclosure")his unstable mental condition. In terms of packaging, the Verve set is the clear winner, with copious photographs, interviews, and even brief analytical comments on many of the tracks by pianists Barry Harris and Michael Weiss (both are clearly disturbed by "Mediocre"). The set is bound like a book, with 150 pages of commentary and photos followed by the disks put in five separate envelope-like pockets; the whole volume is still only about an inch thick. Blue Note uses four traditional gem-boxes for their disks and includes a much shorter booklet, although in the light of the most indulgent "tributes" in the Verve set such restraint has its advantages (in fairness, the majority of the Verve material is enlightening). Both sets are "complete" in that they include alternate takes (13 on the Blue Note, 14 on the Verve, along with several false starts and a certain amount of studio chatter on the Verve), and this will lead to considerable cd-programming for all but the most dedicated listener. It is a real question when such "complete" documentation is truly enlightening and when merely fetishistic, but at least cd's allow an easy solution to the earnest exhaustiveness. Is such exhaustiveness finally warranted? Along with the lesser-known and even more troubled Elmo Hope, Powell is credited with creating the modern piano style of single-note right hand runs and left-handed chordal punctuation, a basic approach which generations of pianists have drawn on after him. But stylistic innovation alone doesn't make for a compelling musical presence: it is Powell's ability to create memorable music that makes him relevant to modern listeners. Alternate takes, endless documentation, chronological tables and lay-outs of recordings all finally fail to provide a decisive grasp of Powell's appeal. Repeated listens make it clear that it is much more than mere rapidity of execution that make Powell's best playing so gripping. His overall intensity, his ability to give clarity to his phrasing even when the notes within phrases became indistinct, and the drama and melodicism of his solos seem to be the central ingredients that make him stand out over the host of imitators who followed him. Finally, however, it may be fascination with the man himselfhis ability to express moods and feelings through musicmore than his mastery of the highly demanding be-bop idiom, that makes even his lesser efforts sporadically compelling. In this sense he is very different from that other be-bop masterCharlie Parkerwhose output has been subjected to similarly intense and exhaustive connoisseurship over the years. Parker's every note has some interest to specialists, but his best solos are so perfect of their kind, so without parallels in his or anyone else's work, that it is tempting to measure his other playing in the teleological terms of how closely it approaches the mastery of form and emotion on the peak Dial and Savoy sides. In contrast, Powell produced no compact body of work that embodied such absolute mastery. He was in a constant struggle. The Blue Note and Verve boxes provide two extended narratives of the successes and failures of that continuing, ultimately doomed fight.